Office-Politics » Distant corner office vs Cube next to Boss? Distant corner office vs Cube next to Boss? We are doubling the size of our current office space due to rapid growth. At the current office where I am one of several managers, I have a corner office right next to my boss. My boss is taking the choice office at the far end of the new office space and if I move to stay close to him, I will have to give up the corner office and move into a smaller space. If I stay in my current office, I will be at the far end of the office from him. 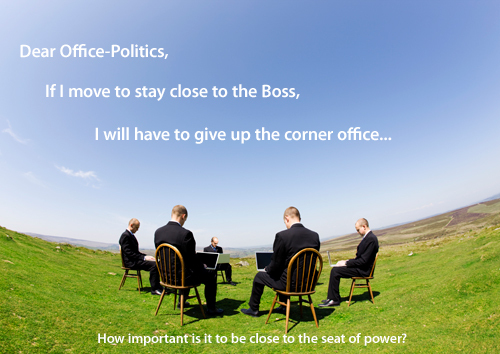 From an organizational perception standpoint, how important is it for me to be close to the seat of power? If I do not move close will I be viewed as less important? Out of the loop? Out of sight out of mind? Management experts could argue this question many ways, but since you asked me I’ll weigh in with my point of view. Power in a corporation is not from material trappings or the title on your desk. It comes from being trusted and wielding influence — whose ear do you have? Can you speak directly to the top decision-maker, or is everything you say filtered through levels of management? If your views are filtered by others you can still impact change — but it’s more difficult. Also, in making your decision, I would reflect on human nature. The more casual opportunities you have to interact with your boss, the better. (So long as you are tactful and not pushy or ingratiating). Imagine your boss coming into work in the morning. If you are in a cozy cubicle near his office, he can see you busily working away. You can give him a cheery hello, etc. You will be in a better position to pick up on subtle clues in his behavior, sense his shifting moods, and spot opportunities to help out. If, however you are at the opposite end of the office, you are in danger of the out-of-sight-out-of-mind phenomenon. You will have to make deliberate daily efforts to show him that you are delivering the goods. Now this could be seen as overly simplistic, because in many corporations virtual or tele-commuting employees are superbly demonstrating their value — and they are not even on the premises. But it requires more effort and finesse because those workers need to offset the natural advantage of face-to-face daily contact. Good luck and let me know what you decide! Thanks for writing to Office-Politics. Thank you so much… There is currently a great deal of office politics going on and jockeying for power due to growth and addition of “business staff”. I did a number of searches on organizational behavior and office location but surprisingly came up short. I was happy to find your site. It has great info. I agree with Franke, sound advice. In a previous role I was field based and all my communications were filtered by my office based boss before reaching the ears of his boss. It was only much later that I realised that my great ideas were being lifted by my boss and being passed off as his own! If I had been in an office within touching distance of the senior managers I am sure would have been noticed sooner (and not had my ideas stolen). I think that moving to the small office wouldn’t be a bad thing. If you’ve been at you company long enough to become a manager then wouldn’t you boss already understand that you can do the work? Maybe I’m being naive to think that years of service won’t go unnoticed but to me moving in next to your boss makes it seem like you “need” to be next to him. Continue to do your job as you always have and I think thing won’t go unnoticed. If you follow your boss across the office it could be percieved by others that you need to be close to him or you cant do your job. On the other hand going from right there next door to the other side of the office could allow for someone else to come in a “steal your thunder”. I think that you should take the down sized office and move to stay closer to your boss. It will keep you in their mind and in the loop. It doesnt seem like a big deal to cross the office but it becomes a far distance when someone else is close ready to pounce on the role you are in now. Unless your boss… has control problems. They are moving me closer to this insane nut. I work fine with him as long as he is nowhere near me most of the time. The guy spends more time watching other people and stealing ideas than he does working. As an example, he calls in outside help to “assist” him with software upgrades that he expects his staff to do without outside help. The best way to determine if you need to be closer to “the boss” is how you are perceived by his superiors. Do they respect you and value your opinions or do they see you simply as his subordinate? If the latter then move closer, if the former stay where you are. Upper level management will NEVER promote you if they always perceive you as a lap dog. It is only those who set themselves apart who get noticed and promoted. This is all assuming you want to move up the food chain. i have a problem that i think is about to start. a colleague of mine (she is actually a branch chief) but we report to the same boss – came into my office to tell me one of her staff members is leaving and she will be replacing him with a higher level M.D. she said this as she was massaging the leather chairs in my office and eyeing my digs. she also mentioned that she didn’t think the new MD would like the small interior office she had to offer him. she said this as she was eyeing my window view and small conference corner table i have in my office. there was no reason for this lady to come to my office and tell me about her new hire, she came to me just check out my office and put the thought in my head that her new hire was not going to like having an interior office. i have been in my window office for 8 years and until recently after several staff members either retiring or leaving and a huge construction project to my suite, i am now the only masters level person with a window office all other staffers who have window officers are either Mds or phds (some of these staff members are pretty new too). my boss of over 10 years was more senioritycentric but now we have a new boss who is more degreecentric. i think i will be asked to leave my window office and move to an interior office. should i say something first to try to get a feel for where my boss will locate this new hire? should I wait until i am asked? should i try to fight for my office as I feel that I have earned this room? should I just agree to be the “do gooder”? even if I agree, i know that deep inside i will be very upset. I feel that not only would my office be taken away but my good name and rep will also be tarnished since others will think my office was taken away as a punshment. I am a very good worker, always receiving awards and great performance ratings, i really feel this is something i have earned and this will really hurt my morale. what should i do? be proactive? sit and wait and let them take it? please help! !